Railpictures.ca - A.A.Cassidy Photo: Iowa, Chicago & Eastern (IC&E), locomotive 105 (EMD GP9). One of many old GP’s on the Dead Line at CP’s Coquitlam Diesel Shop as part of the GP20C-ECO rebuild program. These old girls go to SRY in New Westminster for prepping, then onto ABC Metals to be scrapped. Select components are used in the manufacture of the new GP20C-ECO units. | Railpictures.ca – Canadian Railway Photography – photographie ferroviaire Canadienne. Copyright Notice: This image ©A.A.Cassidy all rights reserved. 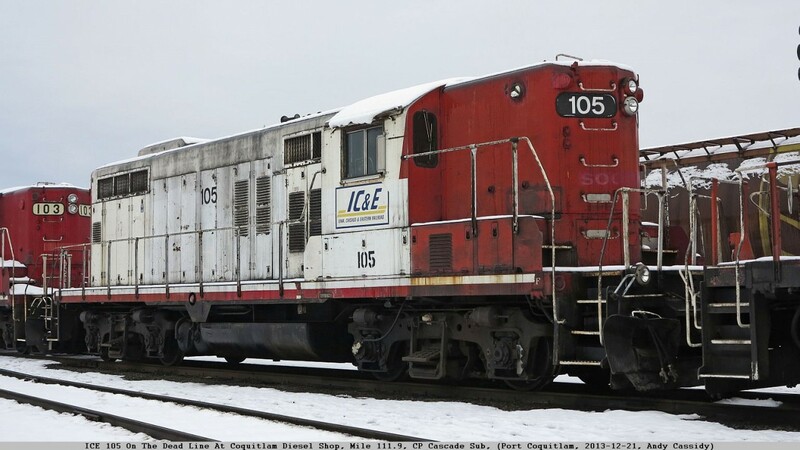 Caption: Iowa, Chicago & Eastern (IC&E), locomotive 105 (EMD GP9). One of many old GP's on the Dead Line at CP's Coquitlam Diesel Shop as part of the GP20C-ECO rebuild program. These old girls go to SRY in New Westminster for prepping, then onto ABC Metals to be scrapped. Select components are used in the manufacture of the new GP20C-ECO units. Ironic that they survived CP/SOO the first time to go work on ICE, and now that they’ve been reaquired it’s off to the scrapper. Thats sad, Andy. I saw this unit not all that long ago at Davenport, IA.